John Gatenby Bolton was born in Sheffield on 5th June 1922. After going through his local grammar school, he won a scholarship to Trinity College, Cambridge. He graduated with honours in 1942 and joined the Royal Navy as a Radar Officer, but was soon recruited into radar research at the then secret Telecommunications Research Establishment (TRE). In 1944, Bolton went to sea on the aircraft carrier Unicorn in the Pacific where he became involved in dangerous flight testing and survived a forced landing in a naval fighter. In Australia, Bolton joined CSIRO whose Radiophysics Laboratory was directed by Taffy Bowen. Radio emissions from the sun had been discovered during the war and there was much activity investigating these by a group led by Joseph Pawsey. There was no shortage of talent in the laboratory and among those who worked there at the time, and were to became famous later, were names like Paul Wild, Wilbur Christiansen, Bernie Mills, Alec Little and Jack Hobart Piddington. Bolton was reassigned to assist in building equipment for an eclipse expedition to Brazil in the following year. It was a matter of great good fortune for astronomy that the expedition was called off and Bolton was ‘released’ to do what he pleased with the equipment they had built. Not withstanding the separation of Bolton from the solar group, his maiden publication in August 1947 deals with the first observations at three well separated frequencies (60, 100 and 200 MHz) of a solar outburst of Type II (as later designated by Wild). Bolton and co-authors correctly attributed the delays in arrival time with decreasing frequencies to the passage of a physical agency upwards through different levels of the corona. They estimated a velocity of almost 1000 km/s, close to that of auroral particles, and noted that an aurora was in fact observed in some parts of Australia a little more than a day after the outburst. The next chapter in Bolton’s story is set in the US where radio astronomy had been taking a back seat compared to the activity in Australia and England in the post war years. 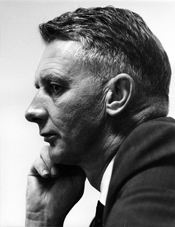 The corresponding centre in the US, set up much later, was the MIT Radiation Laboratories headed by Lee DuBridge. Work on microwave devices and measurements was carried out by a battery of distinguished physicists ‘ Bethe, Dicke, Pound, Purcell and Van Vleck, among hundreds of others. Taffy Bowen was one of the key players in the drama of radar in World War II and was personally responsible for carrying an early sample of a ‘magnetron’ invented at Birmingham University across the Atlantic to the Radiation Laboratories. Bolton went to Caltech in January 1955 and in the six years before he returned to Australia in 1961, he created the Owens Valley Radio Observatory which was quickly recognised as a world centre and which provided a much needed boost to radio astronomy in the US. Bolton’s crew in this exercise came from all over the world ‘ England, Australia, New Zealand, India, Canada and Norway. The graduate students were American and included Barry Clark, Ken Kellerman, Al Moffet and Bob Wilson. Bolton announced abruptly in late 1960 that he was returning to Australia to supervise the steelwork which had commenced on the 210 foot telescope that Bowen had been planning for years. He also surveyed and reset every one of the more than one thousand panels arranged over an acre of surface. The Parkes radiotelescope was commissioned in late 1961 and Bolton took charge as Director of the Australian National Radio Astronomy Observatory (ANRAO) to begin a third and equally spectacular phase of his career. Parkes attracted astronomers from all over the world. More than anyone else, Bolton brought radio and optical astronomy together, through constant interaction with the best optical astronomers of his time, through the use of optical telescopes himself for identification purposes, and through efforts to set up major facilities like the Anglo Australian Telescope and the UK Schmidt Telescope. He was among the earliest to recognise the unity of astronomy across all wavelengths. Several changes took place at the Radio Physics Division in the period 1971-72. Bowen retired as the Chief of the Division and his place was taken by Paul Wild. John Bolton retired as Director of ANRAO but continued in Parkes as Astronomer-at-large until 1981 when after a heart attack he decided to retire and move to a coastal resort in the warmer climate of Queensland. Many honours came his way as they should have, some a little belated like the Bruce Medal of the Astronomical Society of the Pacific. It was awarded to Bolton in 1988, when his health had already deteriorated to the point of ruling out travel to the US, but it was carried and presented to him at a special ceremony held in Australia. The Indian Academy of Sciences elected Bolton an honorary fellow in 1973. Wild JP, Radhakrishnan VR, 1995, Biographical memoirs: John Gatenby Bolton 1922-1993, Historical Records of Australian Science, 10 (4): 381-391. [Australian Academy of Science – http://www.asap.unimelb.edu.au/bsparcs/aasmemoirs/bolton.htm].